I.Love.MorningFood. I love breakfast, I love brunch, I love brinner. 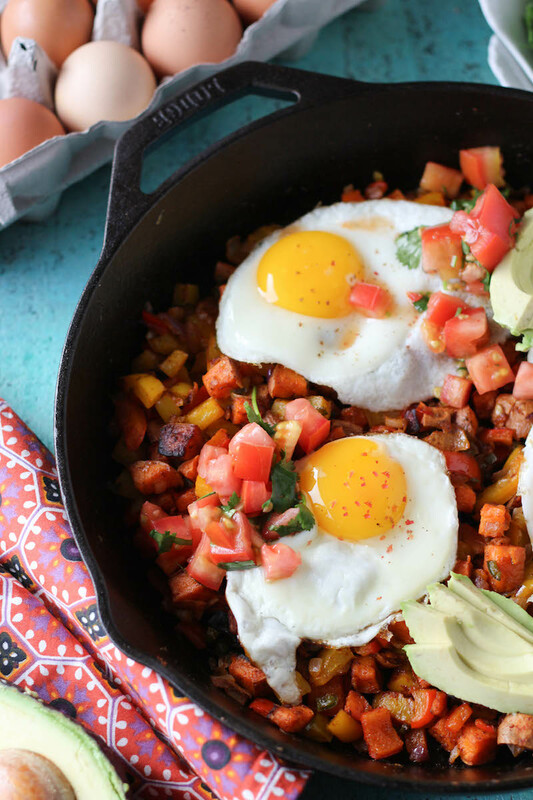 I love anything that has a morning food-flare to it. And hash has become my go-to breakfast because you can have it for leftovers for days afterwards, you can eat it with anything like a burger for dinner, and it literally never gets old. Ever. So I’m always looking for new ways to spice up my hash game and make it better than the last time. Luckily, after hearing SO many blogging friends and paleo-lovers talk about Vital Farms, I decided to try their eggs out and really step up my brunch game. When people make the switch to paleo, I think it can be pretty overwhelming figuring out what kind of eggs are the RIGHT eggs. There’s so many different claims on the cartons, like organic or cage free or pasture-raised or soy free, but no real evidence about what those claims actually mean, so it can be challenging to really navigate the egg carton isle. 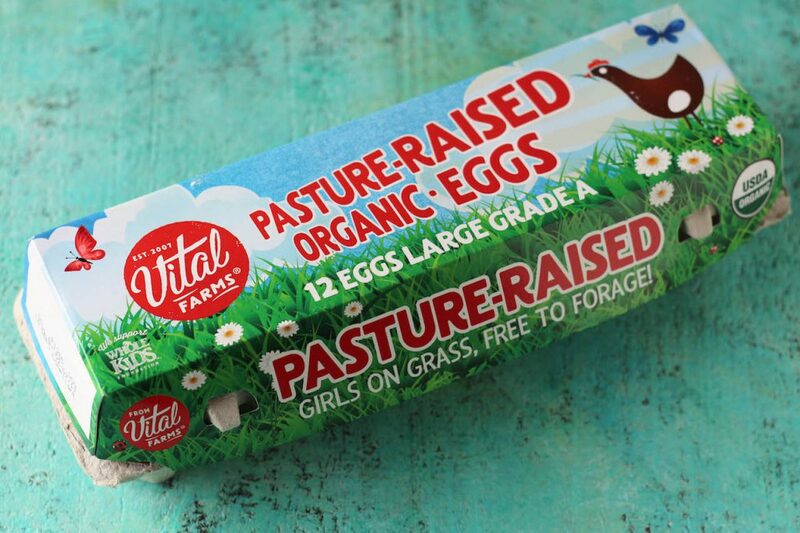 Vital Farms is the first and largest Certified Humane Pasture-Raised egg company in the United States, based in Austin, TX, and a Certified B-Corporation. And if you’ve followed me for any part of the last 4-5 years, you may have noticed that I’m OBSESSED with anything that comes from Austin. At this point in my life, I’m actually trying to talk my husband into moving there in the next few years. Fingers crossed! That way I can run around with all the hens at Vital Farms in the fresh air and sunshine! The hens at Vital Farms live the way birds are meant to: under open skies and grazing on organically maintained green pastures, all day, every day. Not only are they fed a great diet, but they get plenty of exercise and as a result, these happy hens lay delicious, nutritionally rich eggs with wonderfully thick and flavorful yolks – a superior quality product above the rest. Sunshine AND exercise? In! If you’re new to paleo, I think it’s incredibly important to understand why your egg choice is so important. We often talk about meat quality, but sometimes egg quality is swept under the rug when it’s often one of the first things we eat when we wake up. Vital Farms is different than many of the egg companies you may find at your local grocery because of how they take care of their hens. Their hens are pasture-raised and each given 108 square feet of pesticide-free, herbicide-free pasture to roam and forage in! Happy and healthy hens = healthy eggs = healthy humans that eat the eggs! Because of all the space they are given, they are able go through their lives in a natural state – they have space to stretch and flap their wings and dust bathe, as well as freedom to forage fresh grasses, plants, and seeds in the pasture, and snack on bugs and critters they find in the grass for extra protein. Vital Farms eggs are Certified Humane, Raised and Handled under the specifications of Humane Farm Animal Care, a non-profit organization dedicated to improving the lives of farm animals in food production from birth through slaughter. And all of their egg cartons carry the Certified Humane shield. Vital Farms works with over 100 independent, family-owned farms across the United States in the Pasture Belt (states that feature grassy pastures and are warm all year, allowing their hens to have access to the outdoors all year round). They work closely with each and every farmer to ensure they have the greatest chance at success, promoting a business model that is not only about scale, but also about sustainability and support! But honestly, the best part about Vital Farms eggs is that they taste so damn good. For most of my life, I thought all eggs tasted the same, but that’s completely untrue. It’s just like how home cooked food tastes so much better than a restaurants – Vital Farms eggs are the same way. They are creamy, rich and you can just taste the difference. It’s hard to explain, but they are wonderful! Preheat oven to 400 degrees F. Line a baking sheet with parchment paper and place diced sweet potatoes on top. Pour ghee on top and sprinkle with spices then use hands to thoroughly toss. Place in oven to bake for 25-30 minutes, until browned and soft. While sweet potatoes cook, place a large cast iron skillet over medium heat. Add ghee along with onion and bell peppers. Sprinkle with a bit of salt then toss every couple minutes to help cook evenly until peppers are slightly golden - about 10-12 minutes. While peppers are cooking, place all the mixture for the easy pico in a bowl, mix then place in a the fridge to chill until food is ready. Once the sweet potatoes are done cooking, place them into the cast iron skillet with the peppers and place over a medium-low heat to help held the flavors together and keep warm. Lastly, place a large non-stick sauté pan over medium-low heat and grease to make sure the eggs don't stick. Carefully crack 4 (or more) Vital Farms eggs into the pan and cook low and slow for about 5-6 minutes for over easy eggs with the white completely cooked through and yolks creamy and delicious. When the eggs are done cooking, remove hash from heat then use a spatula to place each on top of the hash. Garnish with freshly sliced avocado, a couple spoonfuls of pico, crack pink peppercorns, and cilantro! 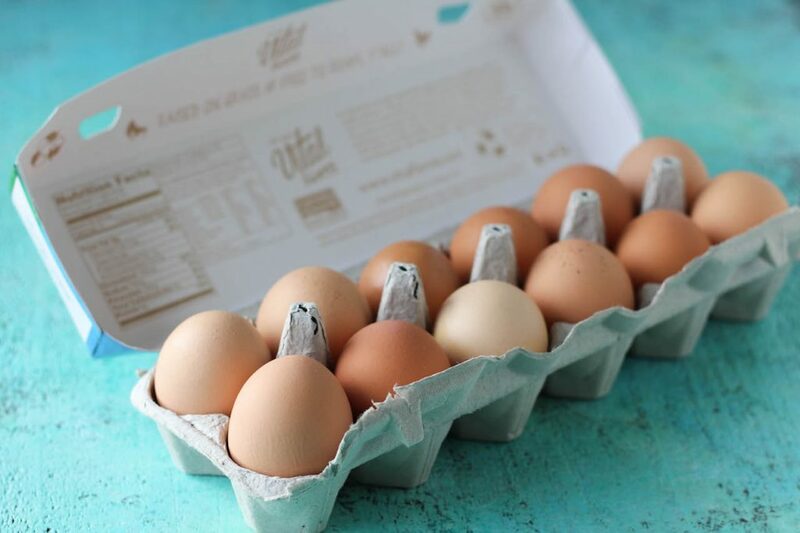 Vital Farms eggs are distributed nationally and can be found at Whole Foods Market, WalMart, Target, and Sprouts stores, as well as other fine retailers. You can find your nearest Vital Farms eggs here! 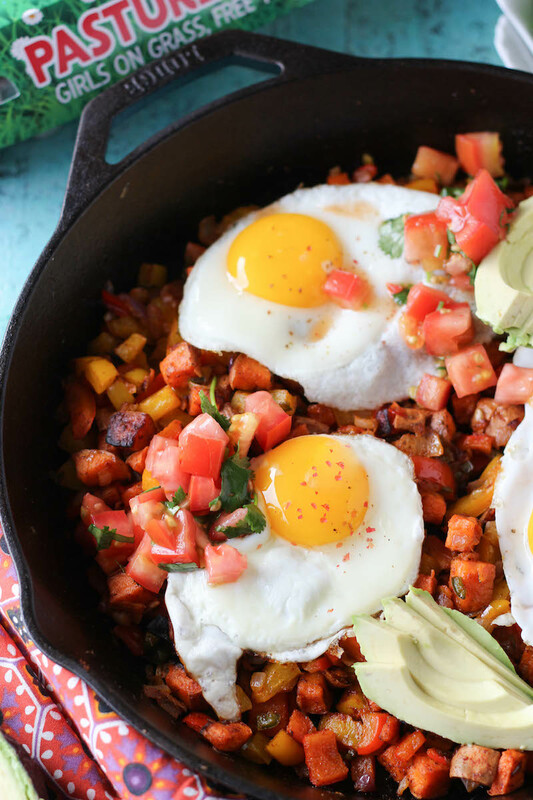 And are you looking for a new ways to mix up your breakfast game? 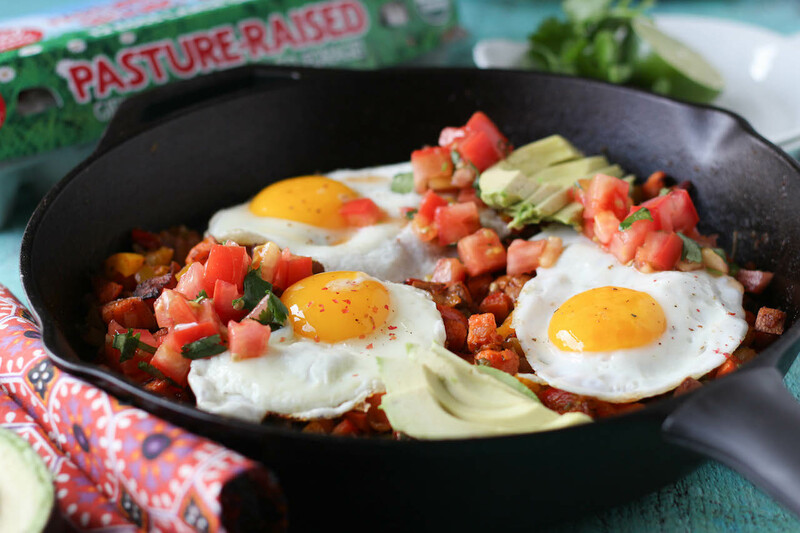 Try out these recipes with some Vital Farms eggs and taste the difference in your delicious meals! This post was sponsored by Vital Farms and I may be compensated through my affiliate links in this post, but all opinions and delicious creations are your ownare my own! This compensation helps with expenses to keep this blog up and running! Thank you for your support with PaleOMG! What I love about this hash is that I’ve been making something super similar to it for MONTHS! 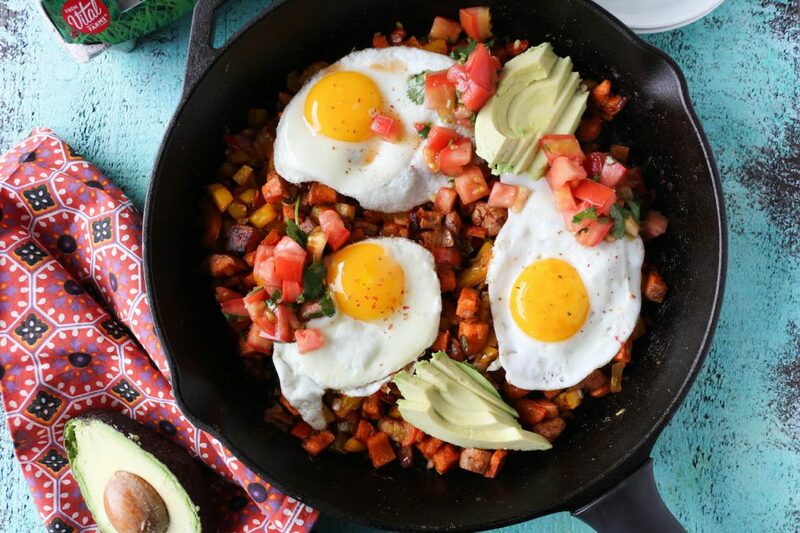 I make your sundried tomato hash all the time from the Paleo Kitchen, and then one day I decided to try it with the spicy sweet potato recipe from your 2nd cookbook…and added some peppers and BAM. What I haven’t thought of?? Adding pico! WHICH IS WHY I LOVE YOU! So genius! I can’t wait to try adding pico! 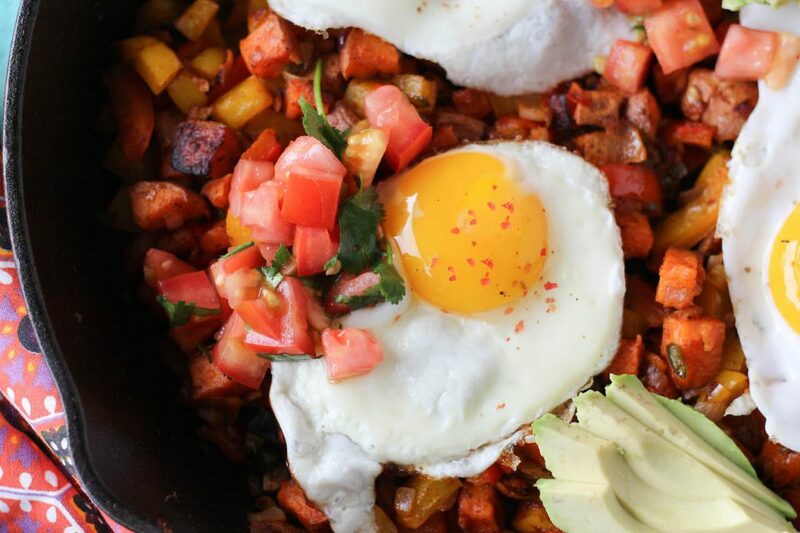 And I totally agree about the hash – I make it every Sunday and we have it all.week.long. It makes perfect breakfast tacos or a side for any dinner. It’s the best ever. it makes such a difference, it makes it SO flavorful!! hope you love it! YES! All of my favorite things in one meal. I agree, nothing beats breakfast. Thank you for always posting such quality content! thank you for the support, jennifer! I love your hash recipes! Definitely trying this one. I made the chorizo/plantain hash with my own homemade chorizo a while ago. Outstanding! Thank you for reminding me about plantains. I have made plantain-crusted empanadas and Pastelon..two Paleo winners. hope you love this one too! These are our favorite eggs too! You can really see a difference in the yolk color (vivid orange/yellow) when you crack them open vs. regular eggs (pale yellow/sad looking). They are worth the extra cost. totally!! it’s crazy how much more colorful they are! I noticed that too with the Vital Farms in the black box…even right next to the organic Vital Farms, which I used to get, the black box ones are ALWAYS more orange. The only eggs I buy. Do you notice any difference in your egg sensitivity eating Vital Farms eggs? I believe I’m struggling with an egg sensitivity and I absolutely cannot have conventionally raised eggs. I seem to tolerate organic eggs in small quantities but I’d be curious to see if it’s an actual egg sensitivity as opposed to something the hens are being fed. Thanks for all the wonderful recipes and product recommendations! I totally understand not wanting to test the theory! Thanks for your reply! I’m sure you’ve addressed this before but I’m still a little confused about some of the labels on meat. Not directly related to this post but you mentioned the egg labels sometimes being confusing and that reminded me of my question! I recently started listening to your podcast…..oh. Em. Gee. I love it so much! Anyway, I was thinking of topics you could maybe chat about. Drinking water, your skin care saga, cheese and dairy. Thanks for the laughs and all the great info! glad you’re loving the podcast!! I’m heading to Austin next week and I am super excited. After seeing you mention Austin above I remembered that you did a post on restaurants there– so excited to check some out!! This is so amazing that I simply couldn’t believe the burst of flavor and deliciousness! Amazing!